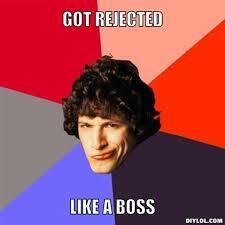 I’ve become accustomed to rejection. I’m still in the early stages of my collection, as yesterday I received lucky number 13 if you’re scoring at home. But this one was different. To paraphrase, it read, in part: Thank you for submitting your story to our online magazine. Unfortunately, our editors did not feel your story was a fit for out site. We liked your writing style and the story did a good job of building tension, but we felt the climax was too drastic a step and too far a leap for the protagonist to take. We thought there wasn’t enough motivation for such a drastic measure. Thanks again for submitting, and please consider submitting to us again in the future. They didn’t want to publish my story, but they liked my writing style and wouldn’t mind seeing me submit something else. I can live with that. I like the site/magazine I submitted to, so if they liked my work, I’ll take that compliment. Still, it’s a bit weird. I’m not complaining about getting another rejection, and I’m not trying to make too much of the fact that they paid me a compliment (for all I know they may say roughly the same thing in every rejection letter). It’s just that it was a weird combination of feelings to experience; the sting of rejection followed by the glimmer of hope. The spank and the rub, if you will. In an environment where rejection falls on and around you like torrential rain, even the smallest of compliments is like a momentary break in the clouds. And now if you’ll excuse me, I’m going to look the story over and submit again, so I need to brace myself for the storm. This entry was posted in Writing and tagged encouragement, Publishing, rejected, rejection, Short story, Writing. Bookmark the permalink. Nice to see such a thoughtful, personalized message! It was a refreshing change of pace, that’s for sure! Absolutely, and I’m sure I’ll be no exception. “The spank and the rub”…Nice. Keep submitting, man. It sounds like you’re getting closer. Here in Brazil we call this kind of “answer” of “bite and blow”. Left to each pick: bite or blow. Hug. Thanks, we’ll keep our fingers crossed!